Discussion in 'Announcements' started by CaptC, Apr 16, 2019. Welcome Tribal Warriors and archers! Gwendoline has returned with a challenge ready for you! So for the next eight (8) Days show off your archer skills and collect amazing rewards. From April 17, 2019 through April 24, 2019 show that your aim is true and be handsomely rewarded by Gwendoline. All you need to do is pick up your bow and arrow and shoot at your desired prize. In this edition you will find boosters, coins, officers, units and maybe even nobles. Remember when activating a unit reward you will need the free provisions or you will loose the excess units! We also have an item in this Gwendoline's game, "coins per village" where you can win a certain multiplier of how many villages you have. For example if you get the 2x coins per village and you have 15 villages you will win 30 coins. However if you decide to only use the item when you have 20 villages, the same item will give you 40 coins! The chances to hit the bullseye are 2 times harder when compared to the other slots. So how do you take place in this new event? 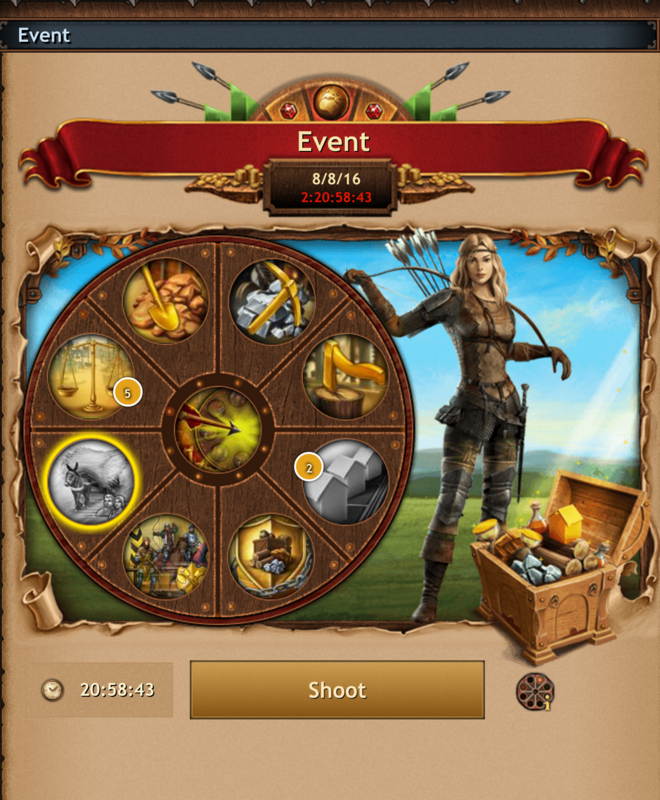 Each day you will have a new wheel of prizes that you can shoot at once for free! The wheel refills when the counter on the bottom left side reaches zero, until then you can shoot your arrows to get the prizes in there. Once you have shot a prize, it will grey out and is deposited in your inventory. Once a reward has been collected you cannot get it anymore in that day, except if you decide to refill the wheel. But that is not all, with every daily visit during the event we offer you, straight into your inventory a free shot. How much does each shot cost? Every day you will receive a free shot, the first paid shot cost 30 crowns and each following shot will cost 30 crowns more than the previous one. And how much does each refill cost? At any given time you can refill the wheel to shoot again for prizes previously won. The first refill will cost 40 crowns and the following ones will be double of the previous one. Keep in mind though that refilling the wheel will not give any free shots. All the free shots you win until the end of this event, and the one from the daily login will disappear after the event is over, all other items will be safely stored in you inventory. We hope you enjoy your Gwendoline's game, and we would like to hear your feedback.